Protecting the Employer - Labour Consulting, CCMA Representation, Employment Equity, Skills Development, Recruitment, ABET (Adult Based Education & Training), SLP Implementation, Safety Training, BBBEE. 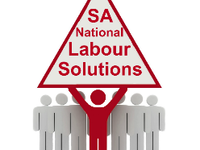 SA National Labour Solutiond is a Network of Human Resources and Labour Relations Professionals who offer clients/members a comprehensive Human Resources, Training and Labour Relations Solutions for the client companies. By utilising the Services of SA National Labour Solutions, you are able to minimise the employment risk within your business. Access codes to the online HR Policy and Procedures. A Summary of the Basic Conditions of Employment Act in poster form. On-line Recruitment at discounted prices. Company Registrations, Deregistration’s, Changes, Company Name Reservations, Annual Returns etc.